Hilton Honors has launched new “Another Day In Paradise” rate plan for stays at participating resorts in re United States including Hawaii, Canada, the Caribbean and Latin America. Members that book this offer get fourth night free except in Hawaii where you need to book minimum of five nights (fifth night is then free). Just a rate plan to keep in mind if you plan to stay at any of these resorts in the Americas + Caribbean. It is sometimes difficult to find discounted rate plans for resort stays outside of sales. Offer is subject to availability, offer details stated herein, and the selected resort’s booking terms and conditions, at participating hotels and resort properties within the Hilton Portfolio in the United States, Canada, Latin America and the Caribbean. Offer requires three-day advance reservations. Offer requires a minimum stay of six (6) consecutive nights and a maximum stay of ten (10) consecutive nights at Hilton Waikoloa Village and Hilton Aruba Caribbean Resort & Casino, a minimum stay of five (5) consecutive nights and a maximum stay of eight (8) consecutive nights at hotels and resorts in Hawaii (except Hilton Waikoloa Village) and a minimum stay of four (4) consecutive nights and a maximum stay of seven (7) consecutive nights at participating resort properties in the US (except Hawaii), Canada, Latin America and the Caribbean. Full, non-refundable prepayment required at time of booking. Your credit card will be charged immediately for the total amount quoted for the entire stay as reserved and refunds or credits will not be issued unless otherwise indicated by local law. Hotel may cancel reservation if invalid credit card information is provided or credit card is declined. Charges cannot be applied to other stays, services or merchandise. Booking cannot be changed. Each hotel has a policy addressing cancellations and/or blackout dates that may apply. Blackout dates, early departure fees, and deposit and cancellation restrictions may apply and vary by hotel. Rates will vary based on individual hotels and specific travel dates selected. Unless otherwise stated, quoted rates are per room per night, based on single/double occupancy and do not include taxes, gratuities, incidental charges and resort fees (if applicable). 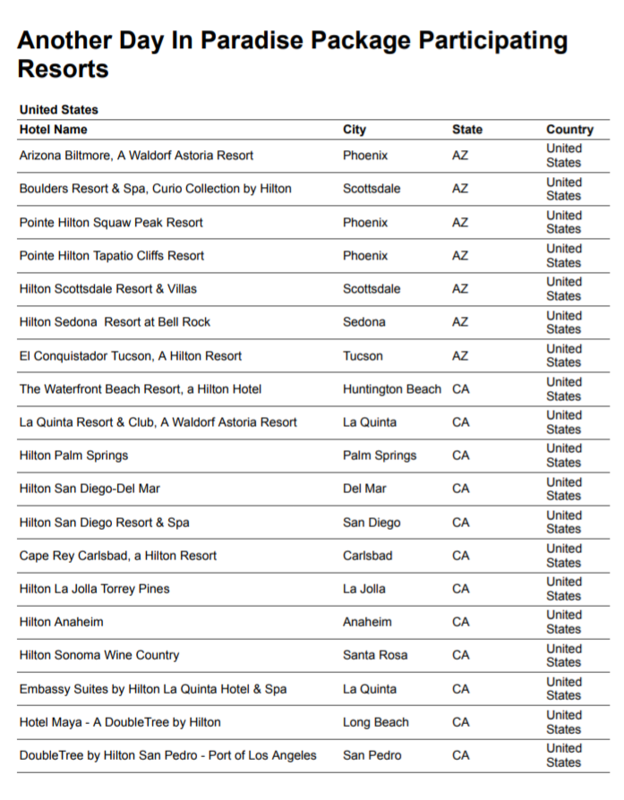 Participating hotels are subject to change without notice. This offer is not applicable to existing reservations or group bookings, and may not be combined with other select promotions, discounts or offers. To reserve this package by phone, please contact us at 1-800-HILTONS if in the USA/Canada, or view a complete list of Hilton local reservation offices. When booking, you must book the “Another Day in Paradise” Package (Plan Code “PBADP4” or “DY4”) to receive all package benefits. Complimentary night is non-transferable and must be consumed during same stay in which it was earned. Complimentary night includes room rate, tax in same category room as paid night(s) and does not include gratuities, resort fees or incidental charges. The value of complimentary night stay will be applied as a discount to the daily rate paid for all consumed nights, which relates to the hotel’s Best Available Rate, (“BAR”), which is a specific rate type that varies depending on time of purchase, is unrestricted, non-qualified and excludes discount or negotiated rates. Early departures will forfeit complimentary night(s) and rate discount not earned on nights consumed. Unless otherwise noted, all offer components are non-transferrable or redeemable for cash, expire at check-out and may not be used or applied on future stays. This offer may not be combined with other select promotions, offer or discounts and is not valid for existing reservations or groups.